WASHINGTON -- As they often do, the new polls released on Thursday sent something of a mixed message on where the presidential race now stands. Two new NBC/Wall Street Journal/Marist College polls gave President Barack Obama comfortable leads in two battleground states, Iowa and Wisconsin, while a new Gallup Daily tracking poll gave Republican nominee Mitt Romney a 7-point lead nationwide. Not surprisingly, another dozen or so polls conducted nationally and in key states found results somewhere in between. At the national level, the Gallup Poll got the headlines (see this Huffington Post report for discussion of why its results look so different), but four other national daily tracking surveys showed a closer race, with results ranging from a 2-point Romney edge to a 3-point Obama advantage. The HuffPost Pollster tracking model, which combines both national and statewide polls to estimate the current polling snapshot, continues to show a very close contest nationwide. As of this writing, the tracking model gives Romney an edge of just three-tenths of a percentage point, although the estimate will update as new polls are added. Within swing states, the two new NBC/Wall Street Journal/Marist polls show Obama leading by comfortable margins -- 8 percentage points in Iowa (51 to 43 percent) and 6 points in Wisconsin (51 to 45 percent). Both states are critical for Obama given the close contest nationwide and narrow Romney leads in states like Florida and North Carolina. But if Gallup's most recent surveys of likely voters have shown a pronounced "house effect" favoring Romney nationwide, the NBC/WSJ/Marist polls tend to skew in the opposite direction, favoring Obama. In Iowa, for example, the last two NBC/WSJ/Marist polls have been among the best for the President. 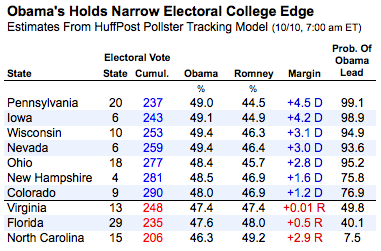 Other recent Iowa polls also show Obama ahead, though by narrower margins. The Pollster tracking model, as of this writing, shows Obama leading Iowa by just over 4 percentage points. Pollster methods may explain some of the difference. Marist calls samples of both landline and mobile phone numbers, while the other telephone polls conducted in Iowa since the first debate use automated methodologies that are prohibited by federal law from calling cell phones. In Wisconsin, the NBC/WSJ/Marist poll was also the best for Obama since the first debate, although here the cell phone factor may not explain the difference. A survey conducted just before the second debate by the Marquette University Law School that called both cell and landline phones showed Obama with a mere 1-point edge over Romney (49 to 48 percent). The Pollster tracking model projects a result somewhere in between, giving Obama a roughly 3-point advantage in Wisconsin as of this writing. Eight other new polls released on Thursday from seven battleground states found more of a mix of results. 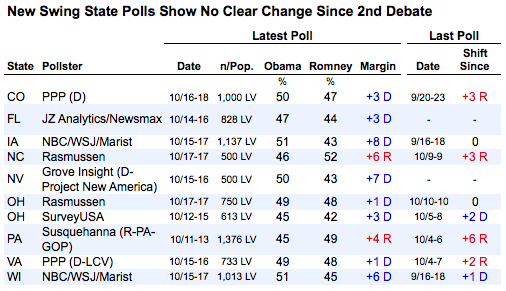 Except for a Rasmussen Reports automated survey in North Carolina and a Republican-sponsored poll in Pennsylvania (by a pollster with results that have consistently skewed in Romney's favor), the new surveys all gave Obama nominal leads. Collectively, the new polls do little to change the Pollster tracking model estimates of the current polling snapshot in the battleground states. Obama continues to lead by statistically meaningful margins of 2 percentage points or better in states like Ohio, Nevada, Wisconsin and Iowa. These states would combine to give Obama a total of 277 electoral votes (seven more than needed to win) when combined with other states showing him leading by larger margins. In addition, the tracking model continues to show Obama with narrower advantages in New Hampshire and Colorado, but tied or slightly behind in Virginia, Florida and North Carolina. The new polls are just beginning to capture sentiment measured after the second debate. New surveys released over the weekend should begin to clarify whether any new trends will emerge. What's happening in your district? The Huffington Post wants to know about all the campaign ads, mailers, robocalls, candidate appearances and other interesting campaign news happening by you. Email any tips, videos, audio files or photos to openreporting@huffingtonpost.com.